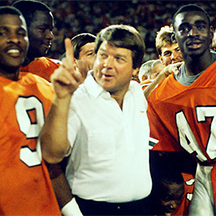 James William “Jimmy” Johnson (born July 16, 1943) is an American former NCAA and National Football League head coach. As of 2010, he is currently an analyst for Fox NFL Sunday, the Fox network’s NFL pregame show. He was the first football coach whose teams won both an NCAA Division 1A National Championship and a Super Bowl. In 1993, Johnson wrote Turning The Thing Around: My Life in Football (ghostwritten by Ed Hinton). Johnson as of 2010 lives in Islamorada in the Florida Keys. Born in Port Arthur, Texas, Johnson graduated from Thomas Jefferson High School(renamed Memorial High School) in Port Arthur, where two of his classmates were singer Janis Joplin and actor G. W. Bailey. He attended college at the University of Arkansas and was a member of the 1964 National Championship football team, where he was an all-SWC defensive linemanfor Hall of Fame coach Frank Broyles, and a teammate of future Dallas Cowboysowner Jerry Jones. Other teammates were Ken Hatfield, Jim Lindsey, Ronnie Caveness, and Loyd Phillips. Several future head coaches were assistant coaches for Frank Broyles and the Razorbacks during Johnson’s career in Fayetteville: Hayden Fry, Johnny Majors and Barry Switzer. Johnson was nicknamed “Jimmy Jumpup” because he never stayed down on the ground for long during football practices or games as it was said his determination was boundless. Johnson’s coaching tree includes a number of future head coaches such as Butch Davis, Norv Turner, Tommy Tuberville, Dave Campo and Dave Wannstedt. Johnson is one of only two head coaches to win both a college football national championship and a Super Bowl. The other is Barry Switzer, who also played college football at Arkansas (prior to Johnson), and was a rival head coach during their college coaching careers. Switzer was Johnson’s successor as head coach of the Cowboys.